Confirm reservations using a VOUCHER number! Use your travel agent or online booking agents voucher or confirmation number to confirm your airport shuttle transfers! Confirm using a VOUCHER number! Email requests may take up to 24 hours to respond to. DO NOT email us for any changes, cancellations or reservation requests within 3 business days of your service. INSTANTLY store our information in your contacts! 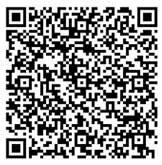 SCAN this code with your Phone and instantly store Karmel Shuttle's information in your contacts.